With one swing, David Hamilton sent Texas State on a long drive back to San Marcos Tuesday night. It’s a 30-mile trek that Texas’ sophomore shortstop, who was raised in San Marcos, should know well. Hamilton’s ninth-inning grand slam lifted the Longhorns to an 11-10 win over the Bobcats at UFCU Disch-Falk Field. 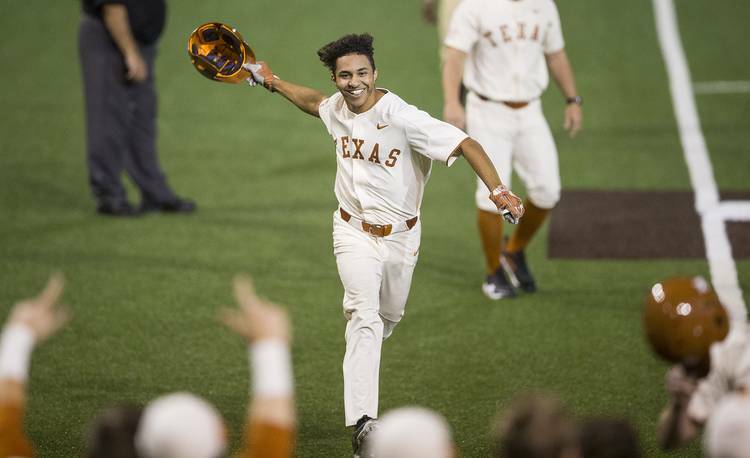 The walk-off win — UT’s second-such triumph of the season — helped the Longhorns avoid a third straight loss. Texas (31-17) is currently the 24th-ranked team in the D1Baseball poll. Hamilton’s heroics came against his hometown team that recruited him to play both baseball and football while he attended San Marcos High. His father also played baseball at Texas State. In five games against the Bobcats — four of which have been won by UT — Hamilton is hitting .500 with seven RBIs, two homers and three steals. So, what does Hamilton have against the Bobcats? Texas fell into a 10-6 hole and seemed destined for a disappointing defeat. The Longhorns, however, rallied back against Bobcats reliever Brayden Theriot, who has saved six games this season. Masen Hibbeler and Duke Ellis led off the ninth with walks, and the Longhorns narrowed the deficit to three runs when Kody Clemens singled and Texas State committed an error. After Zach Zubia was walked and replaced by pinch-runner Austin Todd, Hamilton worked a full count and popped up a foul ball that just got out of play. Hamilton then received a fastball from Theriot, a 6-2 right-hander. Hamilton sent the pitch over the fence in right field. Hamilton’s big swing overshadowed a shaky performance from UT’s pitching staff. Texas, which entered the game with a 4.31 ERA, used nine of its 15 available pitchers. Andy McGuire recorded the only strikeout and the Longhorns surrendered nine hits and five walks. And Texas State (22-22-1) ranks 176th nationally with a .262 team batting average. Texas outhit Texas State 10-9, and its last hack made head coach David Pierce look like a prophet. Hamilton went without a homer in 202 at-bats last year, but Pierce predicted before this season that three of the shortstop’s hits would leave the yard. The grand slam was Hamilton’s third home run, but Pierce wasn’t ready to make any additional predictions after the game. “No. I’ve got to catch my breath,” Pierce said. The soft-spoken Hamilton, however, wasn’t as timid. “I’ve still got some time for another one,” he said. Around the bases: A run-scoring groundout in the third inning gave Clemens his 50th RBI of the season. Texas last had a batter produce 50 RBIs in 2010 when Kevin Keyes (59) and Cameron Rupp (54) accomplished the feat. … Texas turned its nation-leading 54th and 55th double plays of the season. … Junior Chris Fearon, who spent his last two seasons at Howard College and Kansas, earned his first win as a Longhorn after pitching a perfect ninth inning. … Texas relievers Brandon Ivey and Bryce Verplank both threw for the first time in over a month.